Related reading: Nick's review of Mirror's Edge Catalyst. But that’s not the case at all. Mirror’s Edge, through its very core, is a hugely effective reaction to the excesses of both modernity and game design. It’s minimalist, but makes a point of it, and that point is far more complex than people are typically willing to concede. In Mirror’s Edge, we take control of a young woman, Faith, who belongs to a rag-tag band of street urchins. 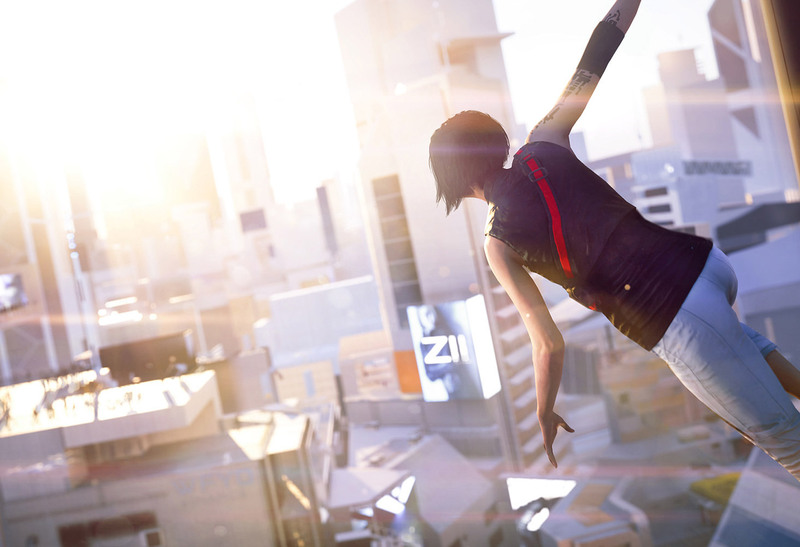 Only, instead of living down on the streets, in the world of Mirror’s Edge, they take to the rooftops of the glistening bright and clean City of Glass. The roof provides one of the only escapes from a true Orwellian dystopia; a near future where the people live in opulence, but at the extent of personal freedoms and liberties; even a person’s ability to work is tightly controlled by the state. The panopticon - the sensation of being monitored at all times, whether you are or not - is strong the moment you step foot away from those rooftops. Buildings are gorgeous, and offices are the kind of places that you’d just love to work in the real world, so breathtaking as they are in their ambition and structure, but it doesn’t take long for those clean lines and chic simplicity to become sinister, threatening stuff. Each time Faith returns to the rooftops is a breath of fresh air – not only because it means mission completed, but because it represents freedom from that sensation of being monitored, or subtly controlled by the space. We’re invited to see the rooftops as a playground as we parkour Faith around them, and in that they’re safe, free, and open. So, living poor on the rooftops, Faith and her friends embark on merry missions that start with breaking into an office complex before escalating into some fairly sinister plot hooks. Ayn Rand fans would see the hostile forces and environments as heaven, but the more rational would understand to be a warning against unhinged libertarianism. 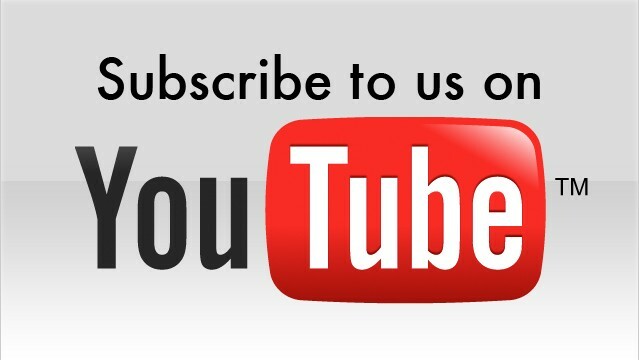 Catalyst’s world is filled with the kind of symbols of libertarian success; successful corporations and business leaders that have earned the ability to play God. The population is kept docile through the massive advertisements and consist aspirational propaganda pumped through the city. The rebel kids are hated not only because they play Robin Hood, but also because they exist outside of the sterile aspirational path to success that Rand made such a focal cornerstone of her philosophy. 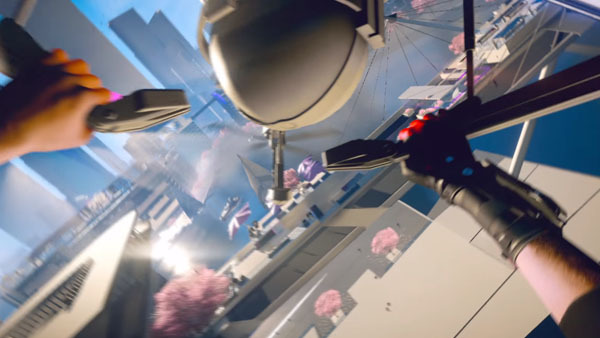 The inherent hypocrisy of the libertarian philosophy comes to bear as Mirror’s Edge wastes no opportunity in highlighting that through Rand’s utopia, the only people who get to enjoy the individual liberties and freedoms that are so important to the libertarian mindset are those that are able to muscle their way into positions of wealth and influence. 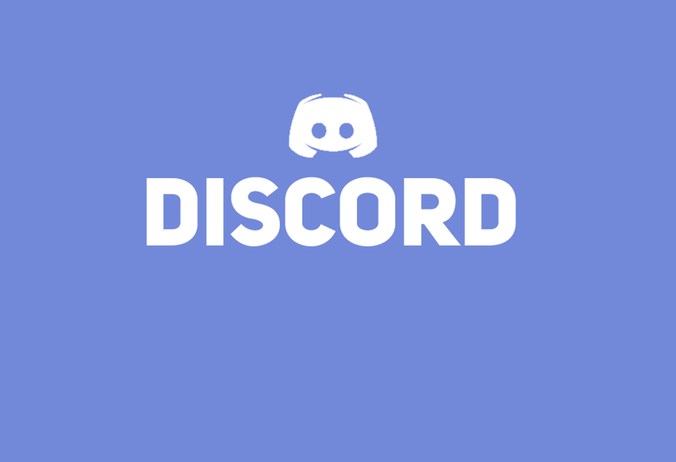 The rest of the population exist to be cowed and prop up their 'superiors'; the health and lives of the masses were rarely of interest to Rand, and they barely warrant a mention in Mirror’s Edge, either, though we know within seconds that they exist, and they don’t enjoy the lifestyle that Faith does. None of these themes are explicitly explored in any kind of narrative depth in Catalyst. Conversations between characters are brief and sharp. Much of the social environment is left to logical clues; we might not see people wandering about the place, but if they’re not there, why is there a massive screen beaming advertisements on that building over there? How much do other characters in the game need to tell us about Faith when we know, by virtue of her refusal to use weapons, that she’s something of an innocent, and ideological in her principles? 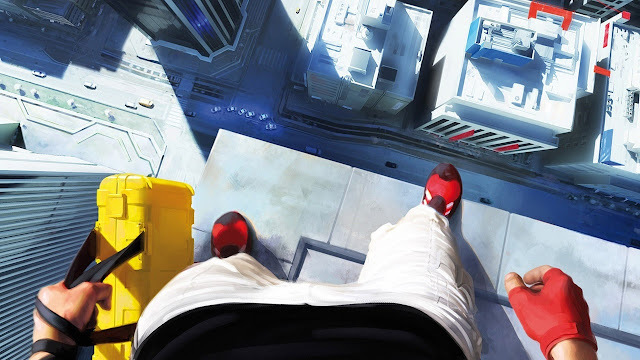 DICE, the developer, isn’t exactly well known for being subtle in its other franchises, so the tonal and thematic subtlety of Mirror’s Edge must be positively cathartic for the development team. Mirror’s Edge Catalyst it not simple purely through its presentational elements. 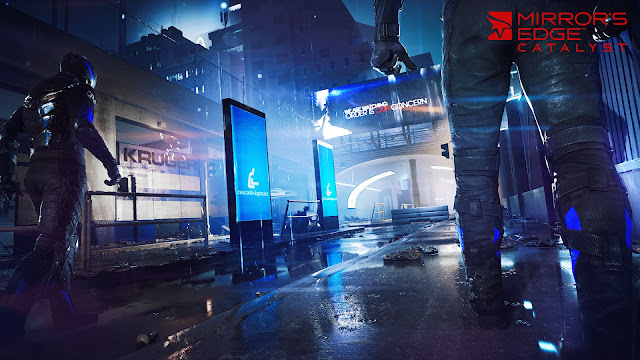 The game also represents a purity in how its play style – the combat system is simple, the goals in the game don’t extend far past running from location to location and ducking, diving, and punching obstacles along the way, and as mentioned, Faith actively resists gunplay; an element that was even present in Mirror’s Edge Catalyst’s predecessor. If there’s any criticism that can be levelled at the game, it’s that DICE decided to throw in an open world and skill unlock tree, and it’s telling that that was a point picked up as a problem by many; there is a real resistance towards complexity that runs through Catalyst, and those ‘gamey’ elements that the developer threw in were uncomfortably alien to the experience as a consequence. At a time where the blockbuster genre is at war with itself in competing to best represent feature creep, be that through offering the biggest open worlds to explore with the most superficial things to do within it, or by offering the most action and bloodshed, Mirror’s Edge’s razor focus on principles that have been around since the 80’s – running and jumping – provides a useful foil to the rest of blockbuster development. There’s a lot of design and narrative thinking that has gone into Mirror’s Edge, and a lot of that has been ignored, because the minimalist surface doesn’t make its thinking over. But in reality, this is one of the more insightful and interesting blockbuster games that we’ve seen in recent years, and good on DICE for being able to execute against its vision. Item Reviewed: Mirror's Edge Catalyst and minimalism; saying a lot with little 9 out of 10 based on 10 ratings. 9 user reviews.